The process of ablation is the removal of diseased organs or harmful substances from the body, often through surgical procedure. If someone in authority abolishes a law or practice, she formally puts an end to it. An aggregate is the final or sum total after many different amounts or scores have been added together. When two or more things, like organizations, amalgamate, they combine to become one large thing. When something is ancillary to something else, it means it supports it but is less important than that which it supports. Attrition is the process of gradually decreasing the strength of someone (such as an enemy) by continually attacking them. If liquid coagulates, it becomes thick and solid. If you conflate two or more descriptions or ideas, you combine them in order to produce a single unit. When a liquid congeals, it becomes very thick and sticky, almost like a solid. Discrete objects are completely unconnected to one another, so each one is separate and individual. When something disintegrates it crumbles, falls apart, or breaks down into separate pieces. When you dismantle something, you break it down into its parts, or destroy something gradually by taking away key aspects of it. When you dispel a thought from your mind, you cause it to go away or vanish; when you dispel a crowd, you cause it to scatter into different directions. To disseminate something such as knowledge or information is to distribute it so that it reaches a lot of people. When something dissipates it either disappears because it is driven away, or it is completely used up in some way that is sometimes wasteful. Dissolution is the breaking up or official end of a group, such as a couple or institution, or simply the act of separating something into smaller components. When something erodes, it wears away or is slowly and gradually destroyed. When you incorporate something into something else, you add it or combine it with that thing so that it becomes a part of it. When you integrate things, you bring them together so that they fit as a whole. To rarefy something is to make it less dense. Sporadic occurrences happen from time to time but not at constant or regular intervals. 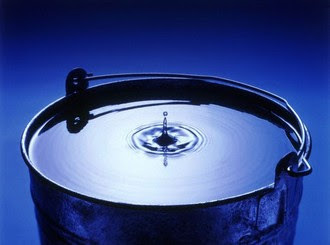 The accretion of water droplets gradually filling the tin bucket echoed in the attic room. Such accretion was the result of a heavy rain slowly leaking through the faulty roof. As the droplets accreted, Tina thought it time to empty the bucket, as it was almost full. She didn’t mind the accretion or building-up of rainwater in the bucket as long as it didn’t spill onto the floor. Quiz: Try again! What is accretion? A large mass of water. An increasing in size caused by gradual small additions. A gathering of similar objects or substances. Accretion is the slow, gradual process by which new things are added and something gets bigger. Shun Concrete The gradual accretion of roads in the growing city, fueled by their primary material, concrete, encouraged some nature lovers to "shun" the area and move to the country. Accretion is the act or state of growing towards a greater whole. 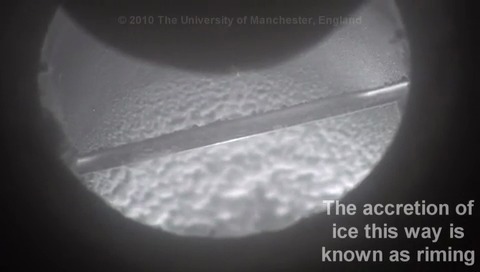 Rime Growth Water in the form of ice undergoing accretion on a rod.